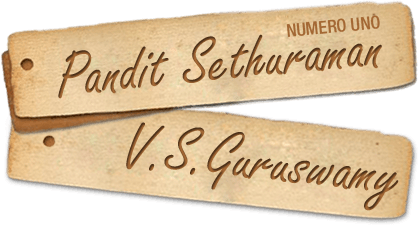 Pandit Sethuraman was a famous Numerology Specialist born on the 31st May, 1925. He had his education in Tiruchirapalli, India. He joined the Defence Services in India, then under the British crown at a young age during the World War II. He quickly rose to an enviable position by his sheer hard work and sharp intellect. His research-oriented mind together with his interest in occult science helped him analyze the lives of hundreds of soldiers in his unit, their victories and defeats or deaths. It was then that he discovered a definite pattern of events in human lives which corresponded to their dates of birth and names. This revelation changed the course of his life. He realized that he was born for a mission that would help the humanity. Spurred on by the wisdom that dawned on him, he decided to pursue his avowed mission of helping people through the science called Numerology. He resigned his job forgoing a high status and salary and followingly, in 1954, published his all- time best seller of The Complete Book of Numerology, “ADHISTA VINGYANAM” (SCIENCE OF FORTUNE) in Tamil. The book was an instant success all over the world. Interestingly, the publication of this book was never advertised or its sale promoted in anyway. The readers who read the book and were benefited by it spread the message it contained and the demand for this extra-ordinary book on Numerology grew in leaps and bounds. That is the secret of success of the original work in Tamil which played an important role in the lives of multitudes of people all over the world. After publishing the thirteenth edition (Tamil) in 1997 while in the peak of his fame, numerologist Pandit Sethuraman passed away. But the legacy continues and the Pandit’s son and disciple, V.S. Guruswamy has brought out the editions in English, Telugu, Hindi and also Chinese for the benefit of global readers in the year 2003. The English version itself has seen its tenth edition and to suit the modern minds, the eBook version of “Science of Fortune” is ready for global readers. V.S. Guruswamy has also published an eBook entitled “My Fortune” which analyses scientifically from a new angle how to progress in life and add harmony to it by using lucky numbers and choosing lucky names! More information is given about person-to-person relationships in the new eBook “My Fortune”. No doubt the readers will find “Science of Fortune” and also the eBook “My Fortune” as the most valuable books on earth that help them attain peace, prosperity and harmony.